I read an article recently suggesting that if we encourage our children to develop critical thinking skills they will begin questioning everything, skepticism in Christianity will build, and they will fall away from the faith. This article struck me as so fear-based that the author appears to believe we can get kids to become tethered to the faith by shutting down, instead of fostering, their thought processes. By…dumbing down their faith? It implies that we should simply teach children to parrot back to us memorized answers to the questions of the faith with no contextualization…and for that matter memorize answers to all learning disciplines and call that an education. Some dislike the term “critical thinking” simply because it is splashed all over the Common Core educational standards. Believe me, there are lots of reasons why I dislike Common Core, but fostering critical thinking skills is not one of them. Let’s dissect this confusing term, take a quick history lesson, and then hold the term “critical thinking” up to the light of Scripture. Hopefully we’ll all see that critical thinking skills are an important component of a robust faith in God. Critical thinking can involve persuasive arguments, and the evaluation of counterarguments. It includes examining concepts or situations from multiple perspectives. A critical thinker knows how to use information to solve problems systematically. They use the art of questioning, but learn how to phrase an effective question. And for the Christian, it means questioning with an earnest heart in the search for truth, not questioning from a rebellious spirit that has no intention of actually seeking truth. Critical thinking should not be confused with being stubborn and argumentative. Throughout the Bible, critical thinking is upheld as a way to discern truth from error, wisdom from folly. Look at those smart Bereans…”now the Bereans were of more noble character than the Thessalonians, for they received the message with great eagerness and examined the Scriptures every day to see if what Paul said was true.” (Acts 17:11). In 1 Thessalonians 5:21 Paul admonishes others to, “Test everything. Hold on to the good.” King Solomon is just one “critical thinker” from the Old Testament, a man that was given great wisdom and insight as he sought the Lord. Critical thinking is traced back to the classical age, prior to the birth of Christ. Most notably were the teaching practices of Socrates (2,500 years ago) whose “Socratic Questioning” method emphasized seeking evidence, closely examining reasoning and assumptions, and analyzing basic concepts. 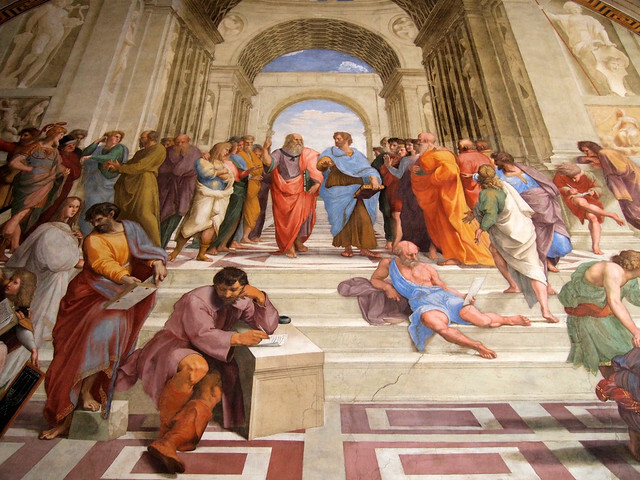 Socrates’ was followed by the critical thinking of Plato (who recorded Socrates’ thought), and Aristotle. In the Middle Ages critical thinking was furthered by others, including theologian Thomas Aquinas, who wanted to ensure that his thinking met the test of critical thought. Aquinas, a Christian, melded critical thinking with the revealed truths of Christianity. He showed that those who think critically do not always reject established beliefs…only those beliefs that lack reasonable foundations. In fact, some of history’s sharpest critical thinkers were distinguished theologians and scientists who professed faith in God. Sir Isaac Newton, for one! The public school system doesn’t have the corner on critical thinking skills, and in fact, I’d argue the opposite. Because children in Christian schools are free to raise questions of faith within any academic discipline, they have the potential to truly think critically (not to mention biblically!) in every area of life…in real time, right in the classroom. Critical thinking skills, under the guidance of the Holy Spirit, has the potential to merge faith and learning in a way that results in a beautifully integrated faith that destroys a sacred/secular divide. As outlined in the pilot project, Mr. Ridder, Head of School at Isaac Newton, explains that children (adults too!) have questions that naturally gravitate to five big areas of life. The teachers are trained in guiding discussions, and faculty members use the Bible to help supply the answers. Then as children study various disciplines…for example ecosystems, the human body, history, literary works…they raise powerful questions and explore information using observation, reason, and logic. Isaac Newton faculty members absolutely believe that the development of critical thinking skills and Christianity are compatible. In fact, they would go a step further and say critical thinking skills are essential to a well-developed mind, and this only enhances one’s understanding of God and a personal relationship with Him. Coming up: What can parents do to encourage critical thinking skills in their children. Kathryne Oates is the Director of Community Relations and Development, wife of 35 years to Bill, mother to Austin and his wife Cailey Sue, grandmother to their children Nate (4) and Alaina (2), and recent mother-of-the-bride to daughter Kaylie (Isaac Newton alum! ), who is married to Ryan Schneider. Bill and Kathryne have used public school, home school and Christian schooling in the course of raising their family…and she counts it a great privilege to promote Isaac Newton to others!